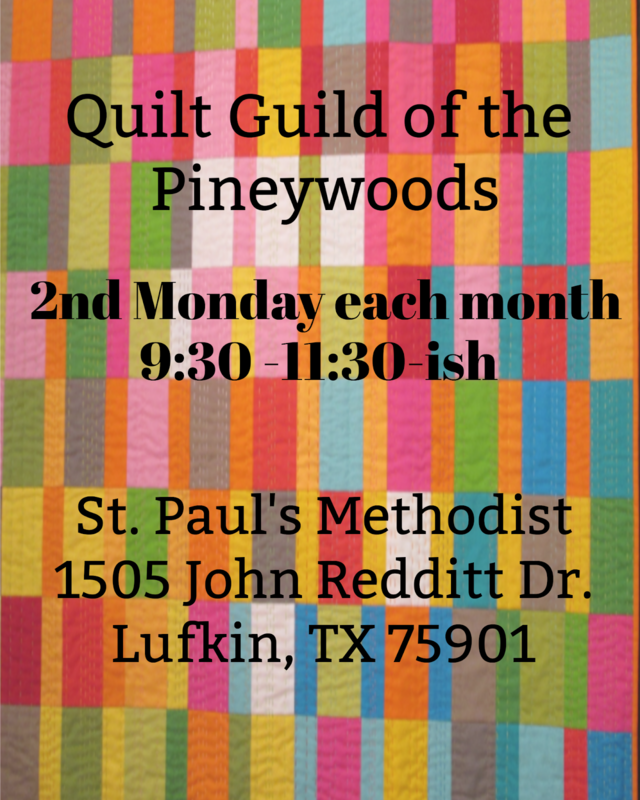 The Quilt Guild of the Pineywoods is a lively group of quilters who meet to share a love of quilting. We have coffee and snacks and fellowship until about 10, then a brief check-in of guild business, an inspiring show-and-tell and then a scheduled program. Members participate in our bi-annual quilt show held every odd calendar year. Yearly membership is $20. We love quilters no matter how many UFO's you have stuffed in a closet or if you are a beginner and think UFO's have something to do with space travel. We'd love to meet you and hear all about your latest project! Contact: If you have additional questions, you may contact me by filling out the Contact Form in the upper right hand column of this page, but be warned, emails are only checked about three times a week due to a severe quilting obsession that only stacks of beautiful fabric can cure! So much fabric, so little time!